What the Balancing the Sword Questions Target. Focus of Study Aid. The primary goal of this study aid is to outline the basic facts of each chapter. 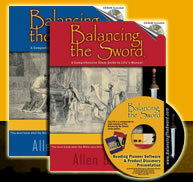 Thus, Balance the Sword targets prophecies which were specifically fulfilled later in Scripture. Verses revealing surprising information or critical commands are also favorites. Likewise, questions about unusual details help you gauge your comprehension. Finally, the study guides spotlight virtually all Messianic passages. There are about 300 elements describing the Messiah that are prophetically set forth in about 90 chapters of the Old Testament. The questions highlight 91 percent of the Messianic passages marking them with "Christ" in the references. The references offer the Old and New Testament evidence for the Messianic claim. Again, every 2.7 verses on average is highlighted by a question. Therefore, these questions will facilitate your attainment of both general and detailed chapter-by-chapter comprehension.